Equine professionals know that clean stalls are healthy stalls. Orderly appearance, safe, healthy environment and professional management are key factors in attracting and keeping clients and reliable staff. Clean horse stalls are healthy horse stalls. Horse stalls that are cleaned with automatic horse stall cleaning tools save time and money, while greatly reducing pain from tennis elbow and carpal tunnel syndrome. Someone finally came up with a better way to clean horse stalls. The most effective horse stall cleaning tools can be defined as the tools producing the healthiest most aesthetically pleasing stall for the lowest cost in the shortest time. Its use reduces cleaning time by up to 65%. Bedding usage is dramatically reduced, up to 50%. The only bedding thrown away is the urine soaked bedding. All horse manure larger than a kernel of corn is removed. Use of the Stall Shi*fter converts physical movement from palms down labor of shaking a manure fork to palms up labor scooping with a shovel. Doctors tell us repetitive palms down motion causes and aggravates tennis elbow and carpal tunnel syndrome. Palms up movements significantly reduce the aggravation and soreness of elbows and wrists. In just a few days of eliminating palms down labor tennis elbow will begin to abate. This method has been the common method of stall cleaning for many years and if done well by an experienced worker produces an acceptably clean stall. Stalls are picked daily with a plastic or metal manure fork. 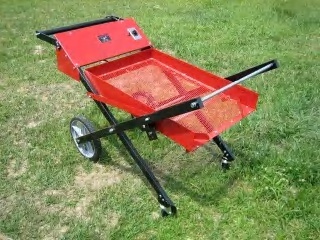 Horse manure is thrown into a muck bucket or wheelbarrow. Standard manure forks have 18 tines spaced about 3/4 inches apart allowing horse manure particles smaller than 3/4 inch to fall through with the used bedding. Approximately 20% of the horse manure is left behind. Newer forks with 30 tines spaced about 5/8 of an inch apart are an improvement but still allow about 15% of the horse manure to remain. Hand picking is tedious and time consuming. Average time to clean a stall is 15 to 20 minutes if done well. The manual method takes its toll on the body and can cause tennis elbow, carpal tunnel syndrome and chronic back pain. Picking is arbitrary and in order to save time or avoid pain, the cleaner often throws good bedding away with waste. Time can be saved at the expense of bedding or bedding can be saved at the expense of time. Neither case makes good business sense in the long run. Additionally, the waste stream can be doubled by the inclusion of bedding that could have been recycled using the automatic method, discussed below. Preparation – Locate the urine soaked bedding and shovel it into muck bucket then roll the Brockwood Stall Shi*fter into the stall, parked over the newly cleared spot. Sifting – Turn the Stall Shi*fter on and shovel the remaining manure and bedding onto the shaking screen until all of the soiled bedding has been sifted, fluffed and aerated. Spreading – Roll the Shi*fter out and spread the pile of clean re-cycled bedding. Replenish with fresh bedding as needed. The primary reason for stall cleaning is to create a healthy environment for the horse. Poorly maintained dirty stalls are home to numerous pathogens that cause infection and disease. Wet bedding is a primary cause of thrush, a hoof disease. Some odors are simply noxious, short-lived, and not harmful, but they do attract flies that cause health problems. A strong ammonia smell signals danger! If you can smell ammonia there is urine-saturated bedding in the stall. Ammonia gas causes respiratory problems by forming ammonium hydroxide, a caustic base, in the lungs and bronchial tubes when it comes in contact with moisture on the tissues that line them. Daily removal of urine-saturated bedding is necessary to maintain peak respiratory function. There are some pretty good products on the market that can be applied to the stalls after they have been sifted. Sweet PDZ is a very good one. 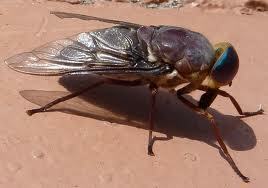 It is easier to prevent fly breeding than to control adult flies. Eliminating the habitat required by the larvae to hatch and grow significantly reduces fly populations. Because flies deposit eggs in moist manure, eliminating moist manure is a good reduction strategy. Eggs can hatch in as little as 7 days under optimal temperature and moisture conditions. Fly breeding season starts when spring temperatures get above 65F and ends at the first killing frost. 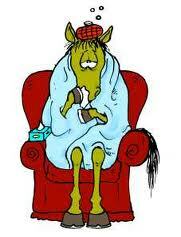 Stalls that are dusty can cause allergy and respiratory problems. As bedding ages and is trod on it breaks down. 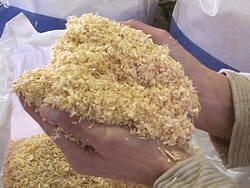 Bagged shavings have a moisture content of about 10% while green sawdust bedding from a rough-cut log mill or a pallet mill is 15% or more. Dust can be kept to a minimum by spraying the bedding with a safe mineral oil such as Arena Rx. Stripping and re-bedding a stall should be done before it reaches a stage where you have to wear a dust mask to clean it. The primary purpose of bedding is the absorption of urine so choose a bedding type with high absorption characteristics. Bedding should be about 3 inches deep if it is spread over solid rubber mats or 4 inches if it is spread over packed clay or crushed limestone floors. Rubber mats provide a measure of padding and insulation and are impermeable to urine, which is absorbed by the bedding. I repeat, the wet spot must be removed daily. It is important to use bedding that is not only absorbent but also as dust free as possible. Guardian bedding and Mallard Creek bedding are both excellent in these qualities. lbs of waterAbsorbed Per lbof bedding. *Walnut shavings cause laminitis so all hard-wood shavings should be avoided unless there is a 100% guarantee that no walnut is in the mix.